Walnuts, like other fruits, vegetables, grains and other plant foods, are rich in dietary fiber. Fiber refers to the portions of these plants that your body can’t digest or absorb. Instead, the insoluble fiber from walnuts and other nuts stays in your intestines to combine with water and promote healthy bowel function. 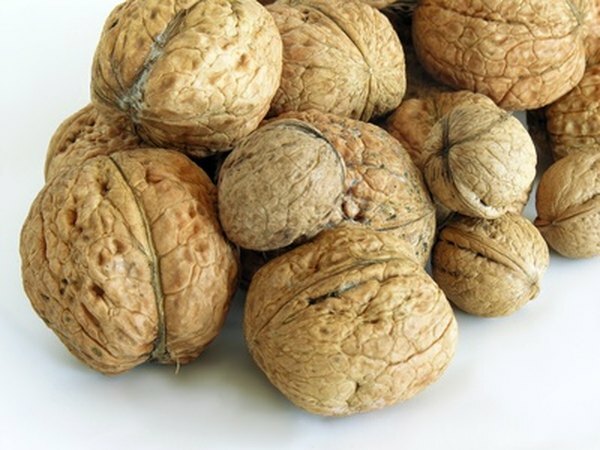 A single ounce of walnuts, which equals about 14 walnut halves, delivers 1.9 grams of fiber. One cup of ground walnuts holds 5.4 grams fiber; 1 cup of walnut halves contains 6.7 grams; 1 cup of chopped walnuts has 7.8 grams; and 1 cup of walnuts pieces delivers 8 grams fiber. Women need to consume 25 grams of fiber each day. Eating just 1 ounce of walnuts supplies 8 percent of that daily goal. Since the early 1900s, when processed foods were introduced in the United States, the American diet has been lacking in fiber. According to the Cleveland Clinic, the average U.S. resident eats only 14 grams of fiber a day. Walnuts and other foods high in insoluble fiber produce larger, softer stools that pass easily through your gastrointestinal tract. This effect reduces your risk of experiencing chronic constipation, which can lead to hemorrhoids and chronic digestive disorders, such as diverticulosis and diverticulitis. Although walnuts are rich in fiber, they are also a calorie-dense food. One ounce of walnuts contributes 185 calories to your diet. The American Heart Association recommends at least four servings a week of walnuts, other nuts or seeds. Select raw, roasted or blanched walnuts and stay away from nuts coated with salt, chocolate or sugar. Add walnuts to high-fiber fruits, such as apples, oranges, cherries, strawberries and raspberries, for a tempting fruit salad loaded with fiber. Chop walnuts and combine them with whole-wheat bread crumbs and use the mixture as a coating for baked fish or baked pork chops. Add chopped walnuts to homemade muffins or sprinkle them over a serving of hot cereal. A handful of plain walnuts makes a tasty and nutritious snack.